Okay, here's the new plan for these pseudo swap-figures: same bio and same BAF piece, one reloadable review; different bio or different BAF piece, two separate reviews that just link to each other. Everybody on board with that? Whether by spell-casting or spectral manipulation, these heroes wield immense power! Spectral manipulation? Was this bio actually written to refer to Vision, or did they trade him out for someone else at the last minute? He has the ability of density manipulation, meaning he can either become harder than diamond, or completely intangible. But "spectral manipulation" makes it sound like he's controlling ghosts - so maybe "Marvel Heroes" (which is the dumbest name for one of these toy pairs yet) was originally going to be Dr. Strange and Brother Voodoo? 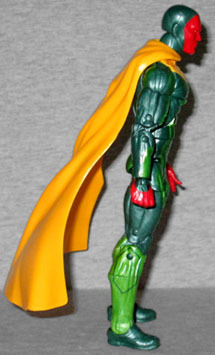 The only new part of the sculpt is Vision's head, but it's not as good as it should be. His forehead gem (the Solar Jewel, but don't be surprised if the comics find a way to turn it into the Mind Gem soon) is technically a sculpted element, but the sculpt is so soft it might as well be painted. They didn't bother sculpting the edges of his mask, either. Of course, maybe they didn't want the head to overshadow the body. 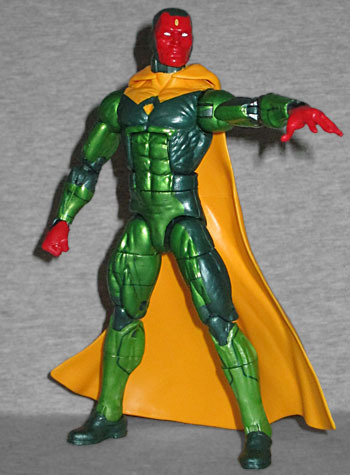 Vision isn't a big guy, so he uses Hasbro's "small" body, with a fist for his right hand, and Spider-Man's "pizza hand" on the left. He's done in his Marvel NOW! costume, and the best thing we can say about it is "it hasn't had a Marvel Legend before." It was a pretty mediocre costume in the books, and it's not been done any favors by being turned into plastic. It's a strange mixture of too much detail and not enough: he was always drawn very smooth and sleek, like a walking iPod, so all the muscles are over-detailed; but the different colors on his costume were divided like panel seams, so the fact that they're just painted here (in colors that are very similar to each other) means they blend in disappointingly. He's wearing Grim Reaper's cape, because apparently designer Andre Lima Araujo didn't think the big wizard collar was important to have any more. Of course, his original designs didn't have a cape at all, so you can duplicate that choice if you want to. Doing this costume properly would have required an entirely new sculpt, which was probably not in the budget - if it was, they probably would have just made a movie Vision (though if they had, it likely would have been the incorrect purple-and-grey, like the rest of the movie merchandise, so this might be for the best). This would have been a good opportunity to do the Young Avengers costume they were supposed to have done before, or the green cape/yellow chest version he wore during Axis. Lots of options other than a not-so-great costume that he's already traded in for a worse one. 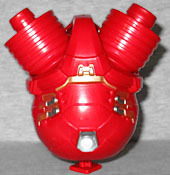 Vision comes with the most important part of the Hulkbuster Build-A-Figure: the loins! It's been a long time since we got a BAF whose torso was in more than one piece, but this means we get to see how the chest joint will be assembled. The balljoint is very stiff - which it needs to be, to support the weight of the upper body - but we really hope that rod is going to be sturdy enough not to break while trying to pose the final figure. As far as figures of Vision go, ToyBiz's version remains the best one available. But that figure is more than a decade old, and it doesn't come with any Hulkbuster pieces, so this version is not entirely without its merits.